CyberLink, online at CyberLink.com, is your place to go for computer software. CyberLink offers a variety of different software products including video editing software, digital imaging, webcam effects, and various other multimedia software products. CyberLink even allows you to download their programs to edit and convert multimedia programs, and a selection of dvds to do so as well. So when in need of some multimedia software be sure to checkout what CyberLink has for you. But first, stop by RetailSteal to find the best CyberLink promotions, CyberLink discounts, and CyberLink coupon codes. Shipping and handling rates vary depending on total of order from CyberLink. International shipping is available. Shipping methods are available for selection at checkout. See website for full details, exclusions may apply. 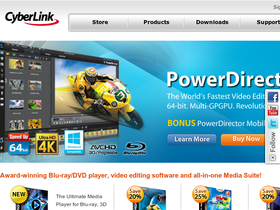 Check out CyberLink.com and enjoy up to 40% off top software including PowerDVD, PowerDirector, and YouCam. Click link to save 50% off PowerDirector software from CyberLink.com. Save 5% on Photo Director 4 Ultra from Cyberlink when you use this coupon code online. Click to save. Save 15% at Cyberlink.com when you use this coupon code online. Click to save. Enter this coupon code at checkout on Cyberlink to save 25% on the PowerDirector 12. Click to save. Use this coupon code on CyberLink and enjoy $10 off your order. Enjoy 10% savings on Media Suite 10 when you use our coupon code online at Cyberlink today. For a limited time only this Fall season, save 30% on select photography software from Cyberlink. Shop at CyberLink to find webcam software for only $35. Click to save. Shop at Cyberlink to find the disc burning program Power2Go for only $55. Save up to 30% sitewide and receive an extra $5 off CyberLink Power Director 12 when you use this promotional code at Cyberlink! Save 10% on your Cyberlink purchase when you enter this promotional code at checkout!